At Bearwood Primary and Nursery School, we value each child as an individual with a unique potential for learning. Our aim is to enable each child to participate fully in current and future society as a responsible, self-confident citizen. We promote the spiritual, moral, cultural, mental and physical qualities of all pupils. We believe that an effective curriculum offers knowledge, skills, understanding and progression. Our curriculum is designed with these principles in mind: it is personalised, reflecting the background and experience of our pupils; it is outward facing, setting learning in global contexts wherever possible; it celebrates diversity to emphasise unity; it is rooted in authenticity and context so that learning is relevant. Unique: We recognise that not only is each child an individual but also each class and each member of staff have unique interests, skills and talents. Our curriculum is designed flexibly to meet the needs of these groups. Rights-Respecting: All decisions are made in the best interests of the child and are framed by the UNCRC (United Nations Convention on the Rights of the Child) and UDHR (Universal Declaration of Human Rights). Knowledge underpins and enables the application of skill. We strive for children to learn skills alongside knowledge, ensuring that both explicitly are developed. At Bearwood Primary and Nursery School we see knowledge and skills as intertwined. The curriculum is about how we can ensure that pupils can achieve both knowledge and skill. We do this by having an emphasis on cross-curricular teaching. We believe that this is important for making the curriculum relevant and meaningful to pupils and for putting knowledge into context. We believe it is our responsibility to develop the literacy and numeracy skills for all our pupils. Using the Early Years Foundation Stage Strategy and National Curriculum as a basis, age-appropriate progression in knowledge for each core and foundation subject has been identified. This has been mapped out to ensure coverage of identified knowledge is secured across KS1 and KS2. We carefully select the sequence of when, what and how knowledge is taught and subject leaders work actively to review this aspect regularly. In addition, the specific skills required to be successful in each subject have been identified and crafted into structured progressions. Curriculum content is grouped into a series of projects. Each project begins with an inquiry question, designed to engage the children and frame the learning journey through to identified outcomes. Initial reflection on this question supports formative assessment of pupils’ starting points and gives an opportunity to pupil voice to lead the project in directions relevant to the specific cohort. During the learning journey, a range of objectives in several curriculum subjects are addressed. This content is sequenced to ensure that components of knowledge lead to conceptual learning. This analysis is supported by strong subject knowledge from staff and aims for both depth of learning and breadth of coverage. Opportunities to practise knowledge and skills are built into the curriculum to secure deep understanding of each discipline. The curriculum planning ensures a layering of knowledge and concepts so that all pupils can make progress. The length of each project depends upon the identified learning and outcomes. Self-questioning: ask questions and identify problems which need to be solved. Self-confident: persevere; manage risks in order to master new skills, knowledge and concepts. Resist peer pressure by making independent informed decisions. Self-reflective: identify misconceptions; assess progress; recognise misconceptions; evaluate experiences; identify next steps. Definition: emotionally mature with a depth of language learning that enables them to share ideas effectively, including in collaborative contexts. Empathetic: recognise emotions and motivations of self and others. 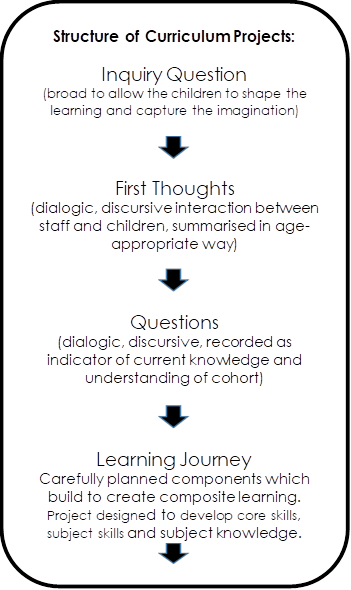 Participate in discussion, dialogue and debate – active listening together with explaining, describing and questioning, valuing their own and others’ contributions. Present ideas accurately through written and spoken forms. Definition: respects the rights of others and is proactive in helping to make the world a better place to live in. Understand issues affecting themselves, the global community and the environment. Respect themselves, the global community and the environment. Proactive: seek to improve themselves, their community and the environment, making choices informed by the framework of human rights.